NURSERIES, pre-schools and childminders in the Downend area are gearing up to provide free places for two-year-olds from next month under a Government scheme. South Gloucestershire is offering free childcare and early education to about one in five two-year-olds for the next school year and twice that number from September 2014. Eligible families are entitled to a maximum of 15 hours a week per child for 38 weeks per year. The total of 570 hours per year can be used more flexibly by arrangement with the childcare provider. The places are being provided for children from low-income families as well as two-year-olds with special educational needs or disabilities and those who have been in care. To find out if you qualify, visit the childcare section of South Gloucestershire Council’s website or call the Children & Young People Information Service on 01454 868008. As reported in May’s Downend Voice, Barley Close Primary was ahead of the game, offering places for two-year-olds from Easter in the former Sure Start centre at the school. 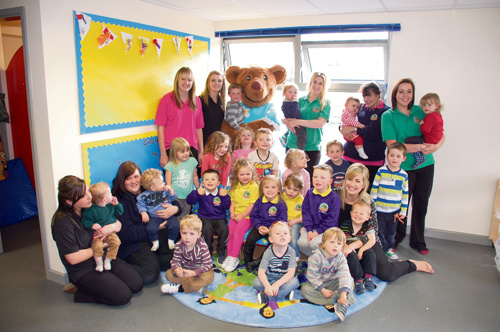 The council has helped to fund a new room at Mama Bear’s Day Nursery in Soundwell as part of a £200,000 investment, which has also included refurbishing the garden area. Nursery manager Rachel Bishop said: “The expansion has been a great asset to the nursery as we can now cater specifically for 2-3 year olds before they move into our pre-school room. She added: “All two-year olds who live in households which meet the criteria for free school meals can now access a free early education nursery place. We want families, who perhaps have never considered nursery before due to financial concerns, to take advantage of this initiative as it will make such a difference to a child’s development. “Although we have the new facilities for two-year-olds, children of other ages can benefit from free places at Mama Bear’s too. Free funded places are also available at Mama Bear’s in Downend and at other settings, including childminders, that are registered to take two-year-olds. DOWNEND: Badminton Road Badgers Pre-School, Lincombe Barn Playgroup, Mama Bear’s Day Nursery, St Augustine of Canterbury Pre-School, Sunbeams Day Nursery. EMERSONS GREEN: Busy Bees Day Nursery.